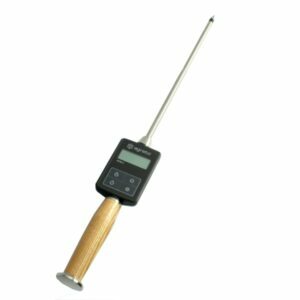 HFM II Moisture & Temp Meter – Harvest Agri Services (Pty) Ltd.
What does a moisture measurement with the AGRETO hay and straw moisture meter HFM II look like? 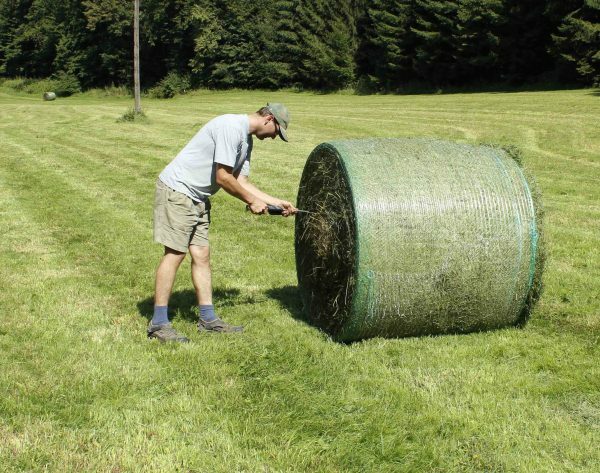 Simply stick the probe into the bales. As soon as there’s enough material around the probe tip, a reading is displayed. Do you need to push a button to start a measurement? No, the AGRETO HFM II automatically and continuously shows the actual moisture level. Even while inserting the probe in a bale, measured moisture levels around the probe tip are shown. This enables a quick measurement of different parts of a bale, or makes to possible to quickly check a large amount of bales. Can the moisture of hay or straw in windrows be measured? The material in windrows isn’t compact enough. You can, however, press the hay or straw in a bucket and stick the AGRETO HFM II in to measure moisture levels. As a last resort one might twist part of the windrow together and stick the probe into the compacted material. These approaches can result in lower accuracy. Can moisture levels in a hayloft be measured with the AGRETO HFM II? Yes, measurements can be made, when the material in the hayloft is compact enough. 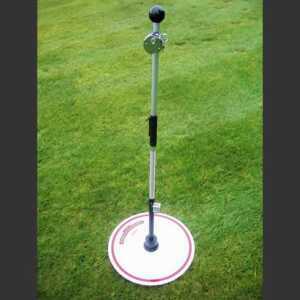 In this case we recommend using the option with a 1 m or 2.7 m long probe. 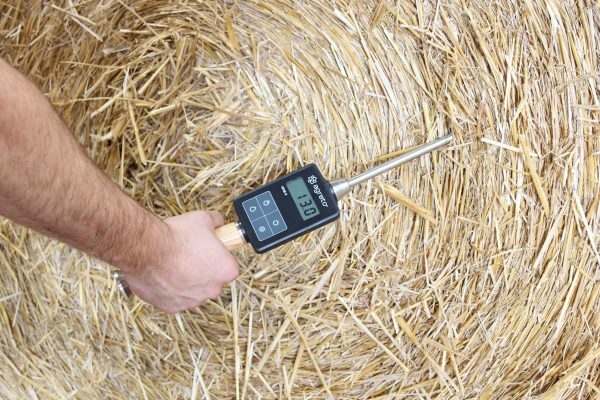 In practice, it’s hayloft temperatures that are monitored, something the AGRETO hay moisture meter can do as well. Does the instrument have to be calibrated? No, the AGRETO HFM II is calibrated in the factory and doesn’t need to be re-calibrated later. How accurate is the AGRETO hay and straw moisture meter? The instrument’s resolution is 0.1%, accuracy can deviate +/- 0.8% in practice. This accuracy can only be guaranteed up to a moisture level of 20%. Deviations can be greater when moisture levels are higher. How is power supplied to the AGRETO hay moisture meter? The instrument contains a 9 V block battery. 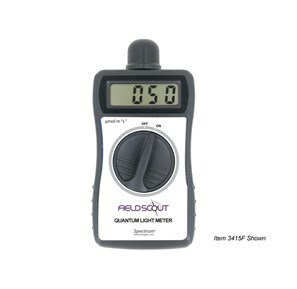 Because of the meter’s low power consumption, the battery supplies enough power for many thousands of measurements. Does the probe need to be cleaned? The probe and its tip are made from stainless steel and normally don’t get dirty. Is there a danger of the probe or tip breaking off? No, the AGRETO HFM II probe’s stainless steel tube continues through the casing and the handle, and is fixed to the end cap. This prevents damage to the probe under normal conditions. The tip is also constructed in a way that it can be inserted in extremely compact bales. Can the AGRETO HFM II be used to measure moisture levels in silage bales? In principle, yes. The AGRETO HFM II measures moisture levels of up to 70%. Values between 50% and 70% are shown alternating the value and the note “H”. Values above 70% are shown with the note “H”. This means that very large inaccuracies are possible. Because of large fluctuations of moisture levels within silage bales and the increasing inaccuracy of a fast measuring device, only a coarse estimate of moisture levels in a silage bale can be made. Can the AGRETO HFM II be used to determine moisture levels in wood chips or shavings? 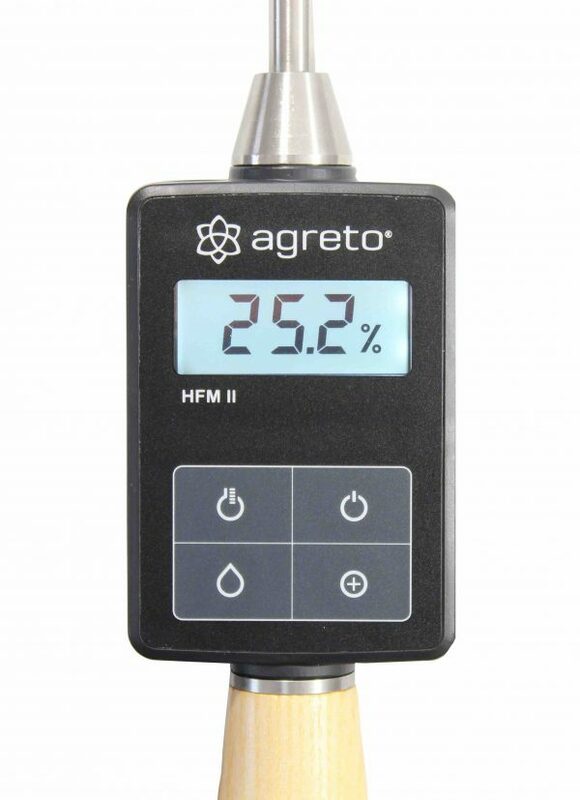 The AGRETO HFM II will show a moisture level for every material. However, the measurement process and construction have been optimized for hay and straw bales. Values measured in other materials can differ greatly from the real moisture level, but can still be used as a relative estimate. How do you measure temperature with the AGRETO hay and straw moisture meter HFM II? Switch to temperature mode and stick the probe into the bale. Wait until the value has stabilized before taking a reading. The AGRETO HFM II has a highly sensitive temperature sensor that quickly adjusts to the material. Can the AGRETO HFM II be used to measure temperature in bulk material like grains? 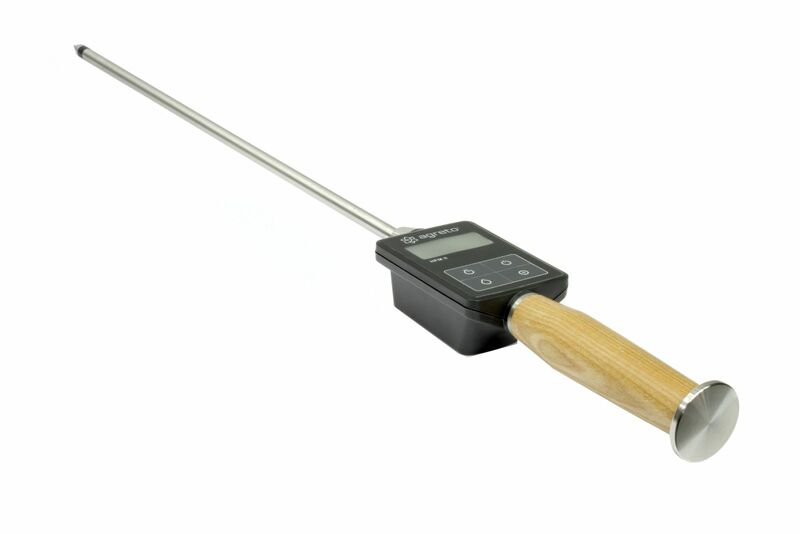 Yes, the temperature can be measured in all materials in which the probe can be inserted. Any more questions? Please contact us!